This is a small (23 mm x 23 mm or 0.8 sq. inch) pcb with Murata's CMWX1ZZABZ-078 module, consisting of a STM32L082 host MCU and SEMTECH's SX1276 LoRa radio modem, along with three useful I2C sensors, 16 MB SPI flash memory, and battery charger. 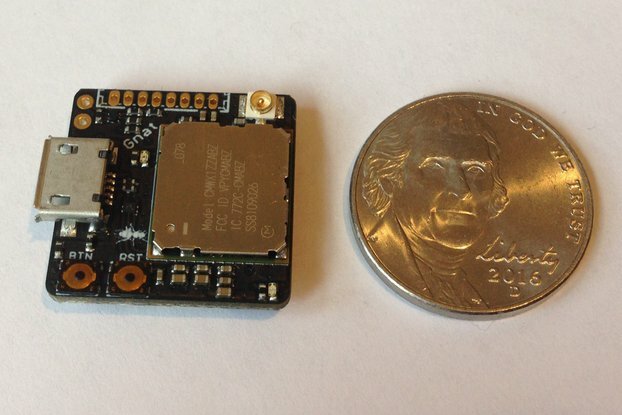 The Cortex M0+ processor runs at 4, 16, or 32 MHz with 192 kB of flash memory and 20 kB of SRAM. The system core and Arduino wrapper are written from scratch to be complete, robust, and power and memory efficient. 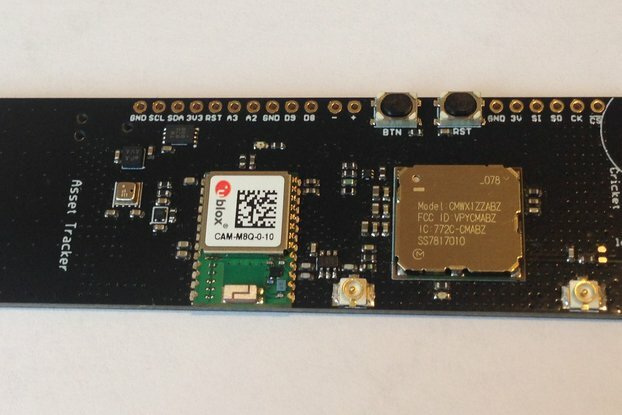 The LoRaWAN API makes using the LoRa radio modem simple and easy. Each LoRaSensorTile has a unique 64-bit (8 hex bytes) device EUI (Extended Unique Identifier) readable via simple query in any Arduino sketch which identifies the peripheral node to the LoRaWAN gateway or any other LoRa device or LoRa network. This allows multiple LoRaSensorTiles to be present on a network with no ambiguity. 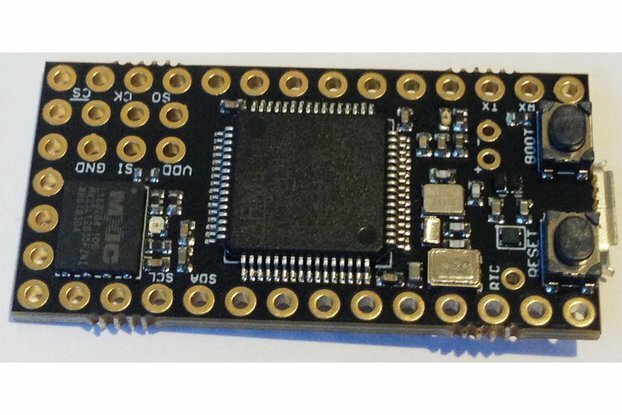 The MCU has all of the usual serial peripherals you would expect from any Arduino-compatible development board including SPI, I2C, UART as well as analog (ADC/DAC/PWM) IO. Also, 16 GPIOs are available at the edge of the board so that additional sensors can be connected to and managed by the host MCU for other applications. 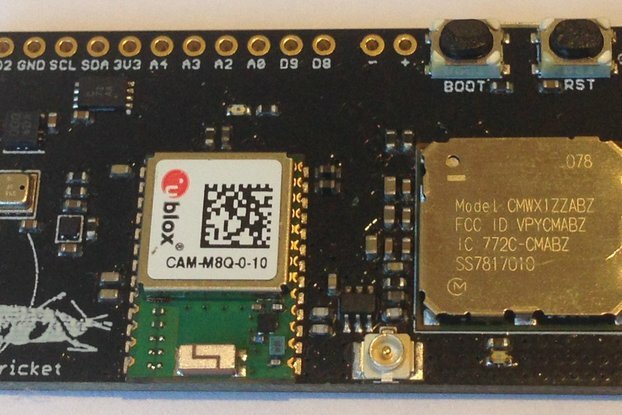 This flexibility makes the LoRaSensorTile a perfect platform for IoT prototyping. The LoRaSensorTile is programmable using the Arduino IDE via the USB connector and serial data output is available through the USB connector for display on the serial monitor of your pc or laptop. The board can also be programmed using an ST-Link and traditional tool chains via the SWD port exposed on the board edge (D8 and D9). The board has three low-power I2C sensors including a Bosch BMA280 accelerometer for tilt, motion, and orientation detection; a Bosch BME280 pressure, humidity, and temperature sensor; and a Vishay VEML6040 RGBW ambient light sensor. 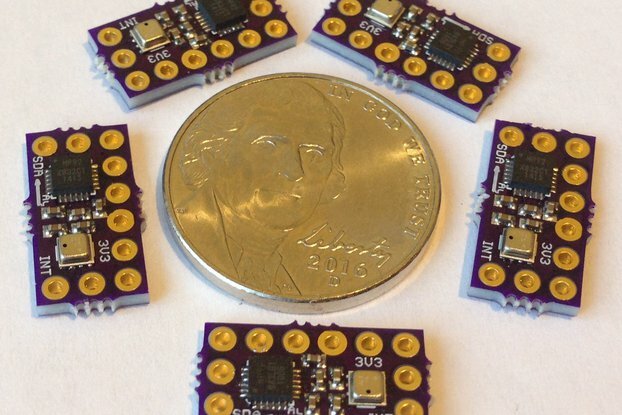 These sensors turn the LoRaSensorTile into an environmental monitor or weather station, etc. 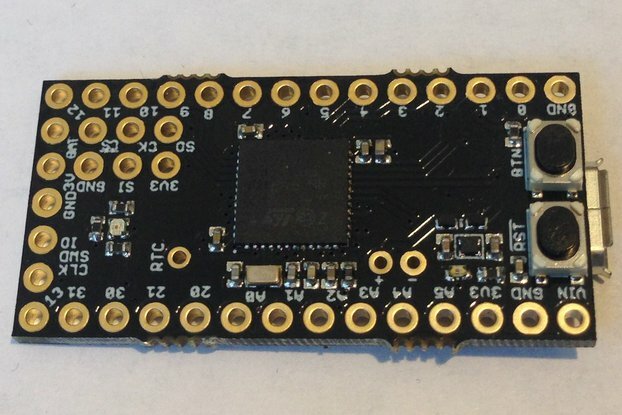 The board includes a MX25L12835FZNI 16 MByte SPI NOR flash memory so that data can be logged and recovered for later analysis. Typical use would be to log all data every minute on the flash and send a subset of the data via LoRaWAN every ten minutes. Most of the environmental parameter don't change very fast so this is a reasonable rate for many applications. You can always program the sensors to alert on threshold crossings and thus enable LoRaWAN data/alert TX more frequently when something interesting happens. 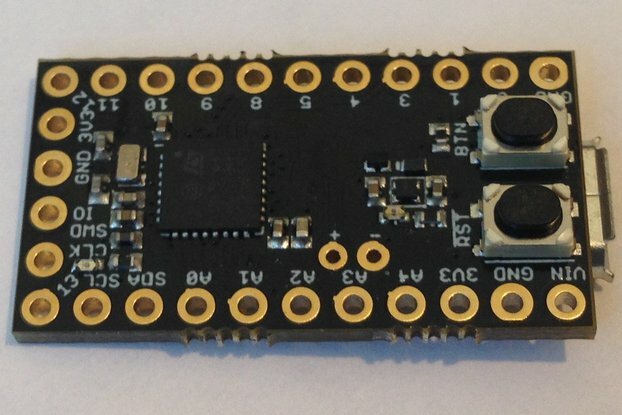 The board is designed to be powered by a 1S 3.7 V LiPo battery and there is a battery charger on the board. The battery can be charged through the Micro B USB connector (500 mA fixed charge current at 4.2 V, yellow led means power good, red led means charging). Non-rechargeable battery types can also be used to power the board such as two or three AA alkaline batteries, a single 3.6 V AA or 1/2 AA LiSOCl2 battery, etc. There is a 270K/1000K voltage divider connected to the battery anode (marked with a "+" near the USB connector) so battery voltage (max. 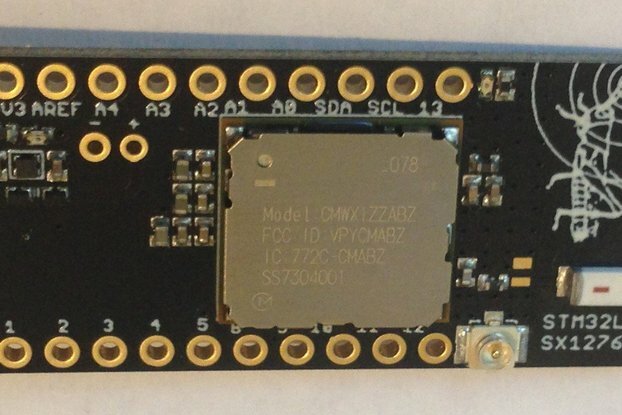 4.2 V) can be monitored by the ADC on GPIO A1. The LoRaWAN protocol requires a LoRaWAN-compatible gateway to receive and forward the data to the internet. I have used both Multitech MTCAP and TheThingsNetwork gateways with success. An API to support simple point-to-point LoRa Rx/Tx between LoRaSensorTiles, or between a LoRaSensorTile and a Grasshopper development board is in progress. Finally, there is a blue led for indication on GPIO D10, active LOW. The LoRaSensorTile has everything you need for an environmental data logger except a uFl antenna and LiPo battery. I like remote environmental sensing but power usage has always been a problem when using wifi. Even BLE requires more power than I would like and the short range nature of BLE (~10 meters) has so far been too limiting. This might change with BLE 5.0, but for now I find the long-range and ultra-low-power of the LoRaWAN technology quite compelling. The LoRaWAN radio uses ~33 mA when transmitting data but it only transmits data every few minutes and then for only 150 ms. This allows tens of bytes of data to be received remotely from peripheral (sensing) nodes as much a one kilometer away at very low average power usage. The range is perfect for remote monitoring of construction sites, factories, office building, and even around the house. I chose very low power components (flash, LDO, battery charger, and sensors) such that the sleep current of the LoRaSensorTile is only ~10 uA. When reading and logging data every minute and sending data via LoRaWAN every ten minutes the LoRaSensorTile uses on average ~40 uA. This ultra-low-power performance means the LoRaSensorTile can run for 150 days on the small 150 mAH LiPo battery shown above. And it will run for years on a couple of AA alkaline batteries. The LoRaSensorTile is small, so will fit just about anywhere. The LoRaSensorTile (AKA Cicada) is easy to program using the Arduino IDE. 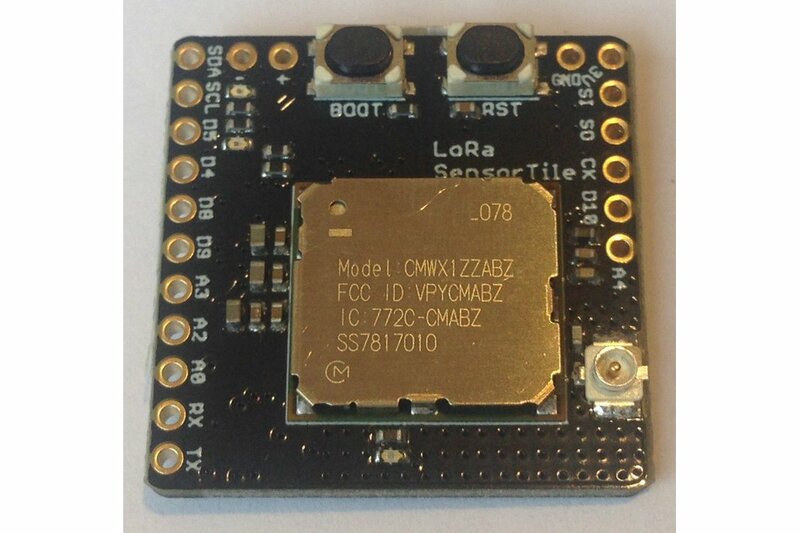 Here or here is a repository of sketches with libraries for all of the sensors showing how to use the LoRa SensorTile as an environmental data logger/remote sensing monitor. The LoRaSensorTile is ready to use (you provide battery and antenna) as an environmental data logger and remote sensor but offers the flexibility to tailor the sensor suite to your particular use case and application requirements. This flexibility makes the LoRaSensorTile ideal as a prototyping platform for both home and industrial IoT products. The applications are only limited by your imagination!